ESXi 5.5 free limitations has been lifted by VMware. VMware ESXi 5.5 Free version limitations to 32 GB of physical RAM only is gone! 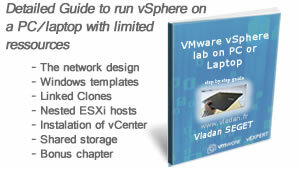 VMware has introduced the new enhanced version of VMware vSphere 5.5 yesterday during VMworld 2013 in SF. So this kind of information interests the whole virtualization ecosystem. But concerning virtualization at home, and all Home users, the IT enthusiasts, IT admins. Everyone using the Free version of ESXi, the hard limit of 32Gb of RAM on the Free ESXi 5.1 wasn’t really a good thing. Update: There is a free version of ESXi 6.0 available now. No physical CPU limit and no ram limit. 8 vCPU VMs can be used…. ESXi 5.5 Free version of VMware hypervisor is now available for download, but if you want to test the vSphere suite together with management server (vCenter) you’ll need at least the Essential Kit. You can download 60 days trial through the link at the bottom of the article. Now there is a nice change on that. Yes, the Free Version of ESXi 5.5 has no physical RAM limit. The free version is the one for which one you, after download, apply a free license key which locks some advanced features. On the virtual hardware version, the new ESXi 5.5 can be configured to run the VMs with 62Tb disks (with small caveat), it can leverage all the enhancements being made in Virtual Hardware version 10. Almost every configuration maximum has been doubled. Yes! If you haven’t read yet, you can check my post VMware vSphere 5.5 – Storage enhancements and new configuration maximums. 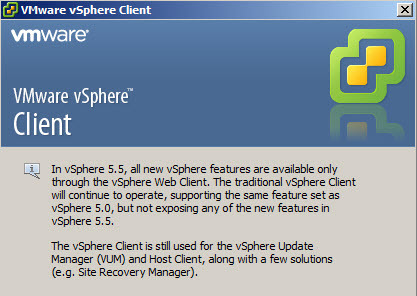 To create (or grow existing virtual disks), a vSphere Web client must be used. Not the Windows client. When managing virtual hardware through vSphere Windows Client, there might be errors shown. As a workaround for this of course you can download 60 days trial, install vCenter or vCSA, attach the host to vCenter, and do your changes (upgrade to the latest virtual hardware, grow the disks if you want to). But IMHO, for home labbing the need of 62TB disks is close to zero… The principal resource which gets exhausted first – is memory. 8 vCPU per VM limit (It’s not often that one would need to run at home 8 vCPU VMs). Update: The other restrictions on Free ESXi, like the non writable APIs for having the possibility to use one of the backup software on the market, and do hot backups, are still valid. You can check out How-to Apply VMware Free License to VMware ESXi. 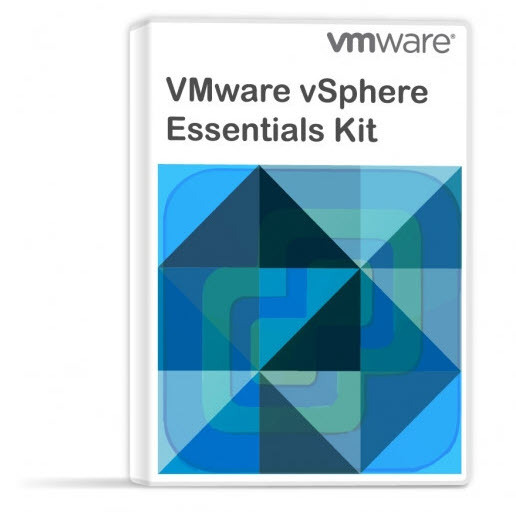 To go further, the first version after the free one, is vSphere Essentials. The only limit here is 6 CPU per bundle (so it’s usually 3 hosts with 2 CPU each). No vRAM limit or entitlements. You can manage 3 hosts with vCenter server (bundled) and have a centralized management. Concerning other higher end licensing offers, I’ll do a separate post to detail all that. But the principal good news is for users willing to use more than 32 GB of RAM on Free vSphere ESXi hypervisor, and it’s (after the product’s availability) now possible. How to run vSphere on Single PC with Limited resources? vGet this free E-book I wrote for people wanting to built a nested lab on a PC with limited resources, or a laptop. An 8gigs of RAM is necessary with preference having a SSD in the machine as well. This nested vSphere lab runs two virtual ESXi hosts together with DC, vCenter all together with client VMs. You can follow the step-by-step guide which is in the book. The download link will be emailed to you after you confirm your subscription. Please allow up to one business day for the e-mail to be validated, as it’s for now a manual process. I hope that you’ll enjoy it and it will be useful. Very much looking forward to breaking past 32GB myself (in my home lab)! on Esxi 5,1 it shows 6 to 7 gb but in vm it show 1 g.b.. i have install vmware tools also.. If you assign for example 4Gb of RAM to your VM, it only consumes the 4GB of RAM at most. You can change the amount of RAM assigned to your VM (VM powered off) by right clicking the VM > “Edit Settings” in the VM. I read all about no hard limit of 32 GB with the free edition of ESXi 5.5 Free version. But can anyone tell about the physical CPU’s. Is there als no limit anymore with ESXi 5.5 Free version? I want to use ESXi 5.5 Free version on a motherboard with 2 sockets, but the memory should be divided over the 2 CPU’s. If the ESXi 5.5 memory was announced to be lifted below the 32Gb limit, then a 2 CPU socket motherboard isn’t really an issue. I don’t see where you want to point with your question. My motherboard has 2 CPU sockets with a maximum of 48GB. But to make use of 48GB, I have to put 2 CPU’s on the motherboard. Now with 1 CPU, I have 24GB. I can’t put more memory into it without a secound CPU. So therefor my question, is there a limitation in CPU sockets in the ESXi 5.5 Free version? Does this mean in 5.5 that if you created a new VM, you would not be able to create a disk for it using the windows client? I c.an live without making really big disks but I’d need to be able to create some typical 120G drives. use the Windows basée client to create VMs with hardware compatibility 9. (Not 10). Is it possible to add a host with ESXi 5.5 Free Version to vCenter Server? I think with earlier versions it was not possible – only licensed hosts. We have licensed cluster and a lab/test host. The free version cannot be added, unfortunately. my goal was to simply install the newest esxi free. i installed 5.5. i installed the vi client for windows that esxi’s server pointed me to. i made an account on vmware.com i registered for my esxi free license. i applied it to esxi with the vi client. i was able to make new vms with hardware version 8. i can change hard drive sizes. is this expected? i did not mess around with the eval license … is the issue that with the eval license you can actually make vms with a hardware version that you can’t manipulate after it expires? and so, if you want to go past 60 days, the lesson is: get your free license and then just do what you can? or am i in for a surprise in 60 days? I think you’re missing few bits overall about vSphere. Basically if you’re using only the ESXi Free version, you can do anything you want with your VMs (change configs, add virtual hardware…..) during unlimited time period. The only thing is you can’t create or change VMs which uses vmx-10 (virtual hardware 10) – those are the VMs which can support 62 TB disks for example. Those VMs can only be modified (or created) via the vSphere Web client, which is present when you install vCenter server (management server) during a trial period, or if you pay for a license. 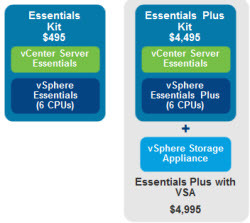 The lowest packaging is vSphere Essentials and it’s around $500. Hope I cleared some of your doubts on that. Wondering how/why anyone would put ESXi onto a PC, then put a VM on top of that for a HTPC? Anyone understand that part? There is no limit on physical RAM any longer. I hope it answers your question. I heard rumour that ESXi Essentials Plus has lifted the 6 Core limit on the CPU – can anyone confirm this? I am trying to get confirmation from VMware themselves too. Thanks in advance. Is this mean no physical CPU limit ? Thanks for the heads up. The post got corrected. I am still using ESXi 5.0, just got my new HW (32GB of ram with 6 cores Xeon and SSDs for sotrage) where I planned to upgrade to ESXi 6.0 free version, but as I am considering more and more it seems to me that it’s better to use 5.5 instead 6.0. In 6.0 I am still not able to use web client for free and we can not afford license for it, sincer we are small bussines. As I understand ESXi 5.5 allows me to use virutal hardware up to version 9 with vSphere client meanwhile 6.0 just up to version 8!? And there are seems to be also some other tricks in 6.0 which were not in 5.5. Kindly please for any your suggestions… I was searching out for any good comparission of 5.5 and 6.0 free version but could not find any… BIG tahnks for your help and for your great website!